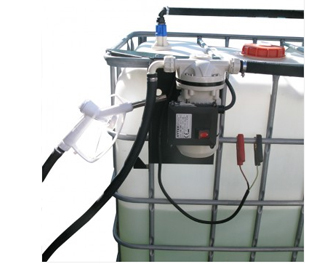 - Designed to fit 1000 litre intermediate bulk containers. - Supplied as a complete kit. Bracket mounts to the side of IBC. - Max. flow 35L/min. Manual on/off switch. Choose 12V or 24V. - 4m delivery hose, 1.5m suction hose & SEC connector. - 2m battery cable & croc clips. Max. run time 20 mins. - Manual Adblue® nozzle with stainless steel tip. - Built in nozzle hanger, weatherproof for outdoor use.